Goa- One of the most sought after vacation destination in India, is on top of the list for most travelers! And it does deserve all the love; after all, it has amazing Beaches, Activities, Sunny afternoons and Perfect snowstorm! Yes, you read it right, Snow Thunderstorm it is. Now you can feel the chills of Antartica at Goa and cool down the beach heat as you relax on snow. There was a time when we would think of any Entertainment in Goa, the beaches and water rides come to mind, but times have changed and we look forward to creating a lifetime experience for you when you visit Goa next. Experience the best of both worlds at one place! The most unique thing about this snow park is the Snow Thunderstorm! 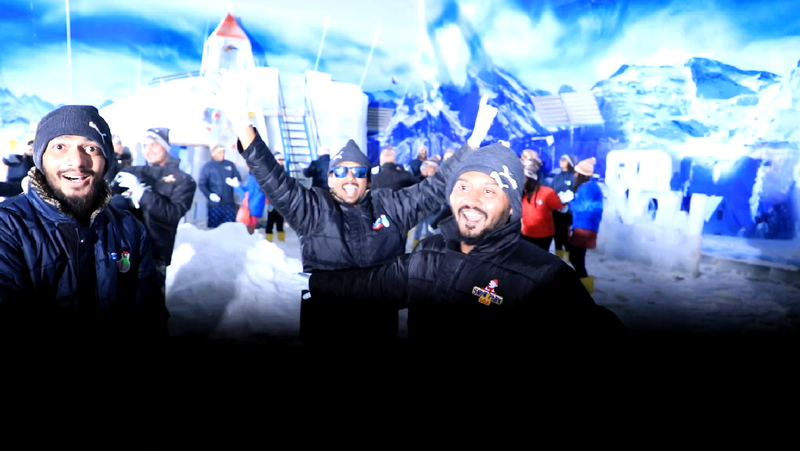 First, of its kind in India, we have taken the snow park game, one level ahead, making it a world-class experience! A Snow Storm is an extremely rare activity and only a lucky few get to witness it for real. Snow Thunderstorm can be much more intense and fun as compared to a regular snowfall. It’s a precipitation activity which has windy and thunderous snowfall. It’s inspired by the natural Thundersnow which like a regular rain Thunderstorm is a marvelous activity of nature. Loud noises of clouds accompanied by lightning and snowfall with extremely fast winds is a thrill for sure! So the snowfall is much more vigorous and furious than something you experience at other parks and while you pant for breath as you sing aloud and dance to the snowflakes wetting you all around will help you create memories for life. There are very few snow parks which offer the thrill of such an amazing activity, with thrilling rides and an ambiance like this makes it one of the best attractions in Goa! And apart from the Snow Thunderstorm, which is the forte of the park, there many rides, and activities which will be seen for the first time in this region! Make snow castles and Snowmen after making sand castles in the day! The extremely talented team has been trained and has done extensive research to create this mind-boggling experience for the guests. Gone are the days when such parks or activities are for Kids only, with this awesome indoor amusement park in Goa, even the elders and adults would rejoice and want to experience the taste of snow! So no matter if you go for North Goa with a motive to party and have amazing time shopping and chilling at beaches, or you go to south Goa, to chill at secluded beaches, roam around the old streets of Goa and enjoy Goan cuisine or you may go on a backpacking adventurous trip. Irrespective of what your reason is to visit Goa, add this new Amusement Park in the list of must visit places in Goa, and be glad to experience something fresh and unique!